Patricia surprised weather analysts with the pace of its growth, increasing from a tropical storm on Thursday to a Category 5 hurricane by Friday morning, more than doubling in power and speed in less than 24 hours. Mexico’s government declared a state of emergency in dozens of municipalities in the states of Colima, Nayarit, and Jalisco. Thousands of people took refuge in shelters across the region. However, initial reports Saturday suggested that the impact of the storm was not as severe as many had feared. There have been no records of any deaths caused by the hurricane. 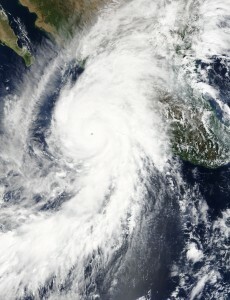 The storm spared the densely populated centers of Puerto Vallarta and Manzanillo. Most of the damage appeared in the small villages between these two cities. For many in these impoverished communities, it could take much time to recover from even moderate damage. On Saturday, Hurricane Patricia was downgraded to a tropical depression. As the storm moves through Mexico, it is headed towards Texas and the Gulf of Mexico; The remnants carrying winds of about 35 miles per hour. The danger ahead in central and northeastern Mexico is that the rains can total 8 to 12 inches and reach 20 inches in some isolated places. That volume of water could cause rivers to flood and undermine the soil leading to possible mudslides. The president of Mexico, Enrique Peña Nieto, is expected to visit communities that suffered the brunt of the damage once more information emerges about the impact of the storm in more isolated communities.